Clean jell off the selected seeds and put them in seed starter medium. Put one seed per container so seedlings can be replanted in a bigger pot without their roots disturbed later on. Water, keep the container covered but leave a small gap for air to circulate then set it where it can get direct sun. If you have a heat mat, set the temperature at 80° F. Keeping the soil temperature constantly at 80° F will help the seeds germinate faster. Fertile seeds will germinate within three weeks. It may take a little bit longer without the heat mat. With one batch I didn’t use the heat mat but put the tray out on a cement floor under direct sun during the day and took it in at night. Some seeds may rot if the soil is too wet. 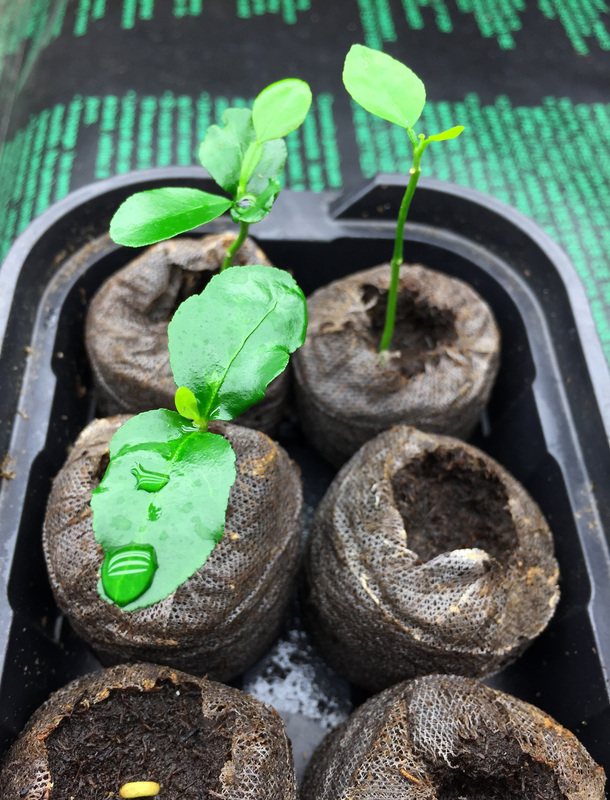 When you start Kaffir lime seedlings from dry seeds, soak the seeds for a couple of hours before putting them in the soil to soften the seed shell. The wet seeds will feel a little bit slimy but that is common for lime seeds. 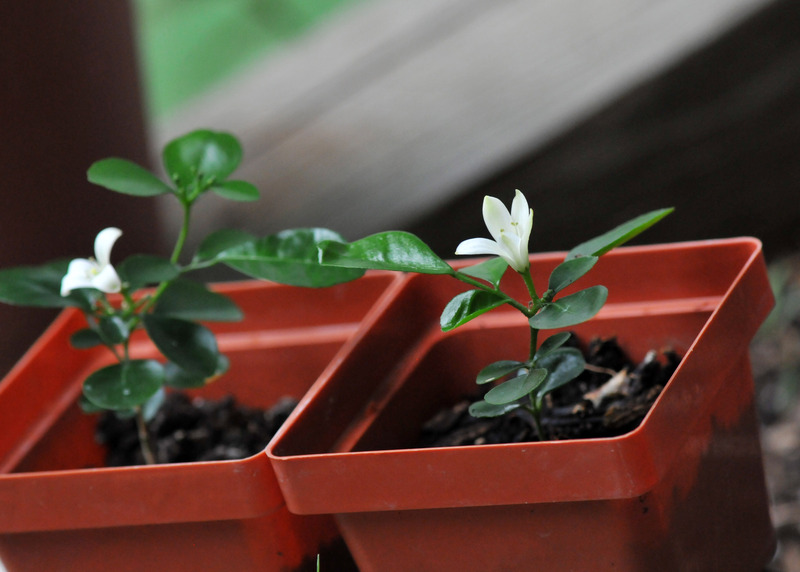 Once the seedlings develop a second set of true leaves, put them in a slightly bigger pot. The potting soil should be loamy and kept moist at all times. The key word is ‘moist’. 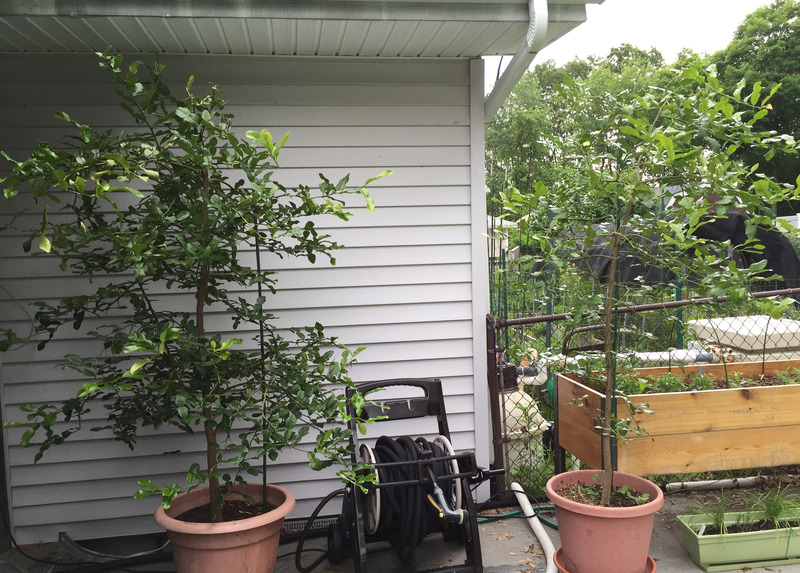 Kaffir lime hates wet, soggy soil. Root rot can be a major problem. So, if keeping the soil ‘moist’ is difficult, stay on the dry side… much safer that way. 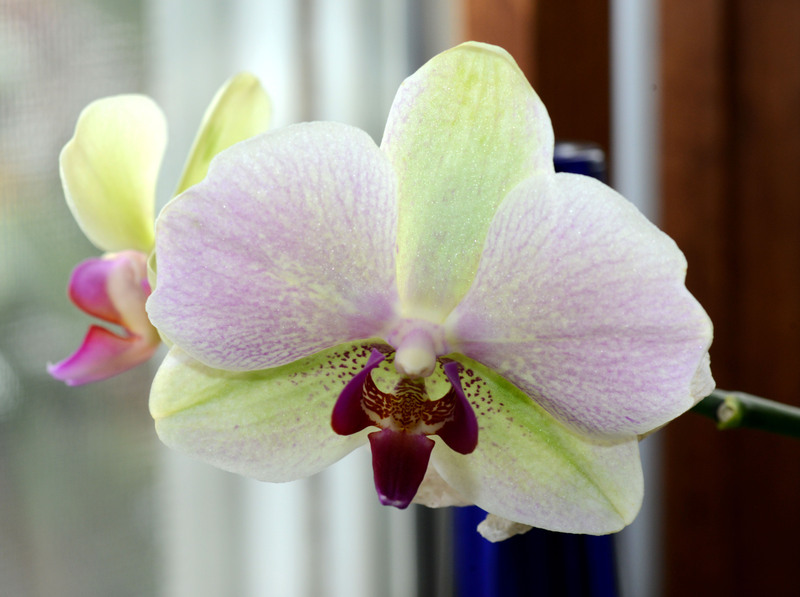 If growing it in the house, keep it on the windowsill where it can get direct sunlight. Plant lights will do if there is no access to direct sun, but the light need to be on at least 8 hours a day. 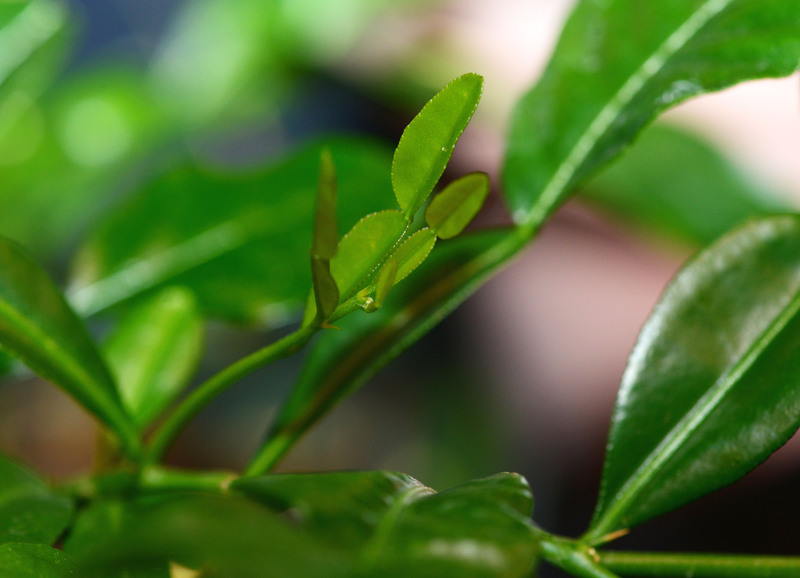 Kaffir lime can stay outside if the temperature is above 50° F both day and night. It can deal with nighttime temperatures between 40-50°F if the pot is situated close to the house. Change some of the potting soil every two years if possible. Loosen the old soil off the roots around 1/3 from the bottom but not more than half then put the plant in a new pot with fresh soil mix with compost at the bottom. Cover topsoil with some fresh soil and compost mix as well. Water thoroughly. Prune branches that crossed and rubbed one another. 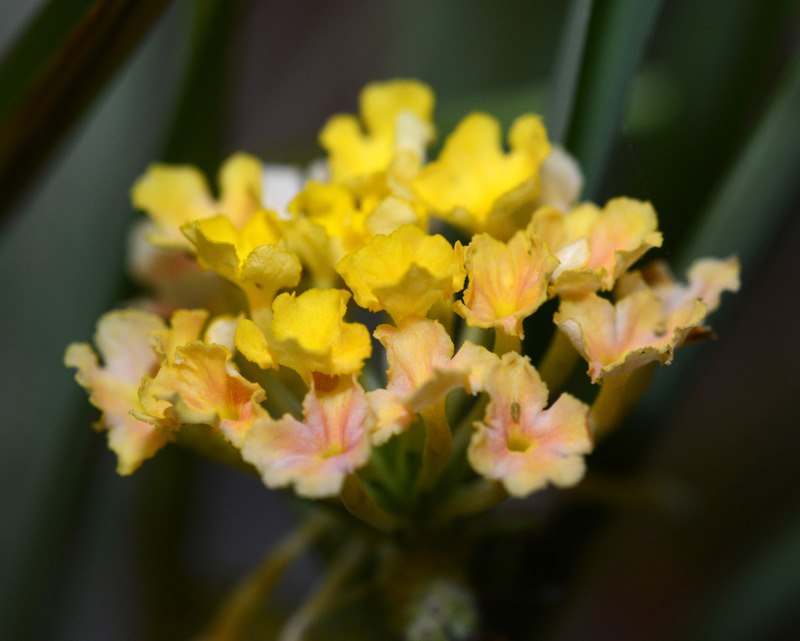 Nip the tip off a plant when it’s around six inches tall. It will start to branch out. Keep the pruned leaves in the freezer for future use in cooking. Feed monthly and keep soil moist. 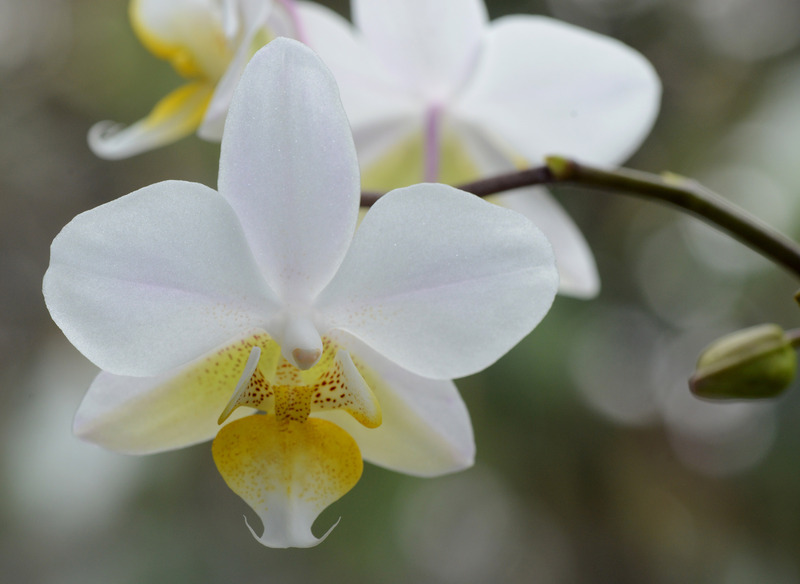 Stop feeding a month before taking the plant inside to over winter and start feeding again a month before bring it outside in spring or when new leaves start to bud. 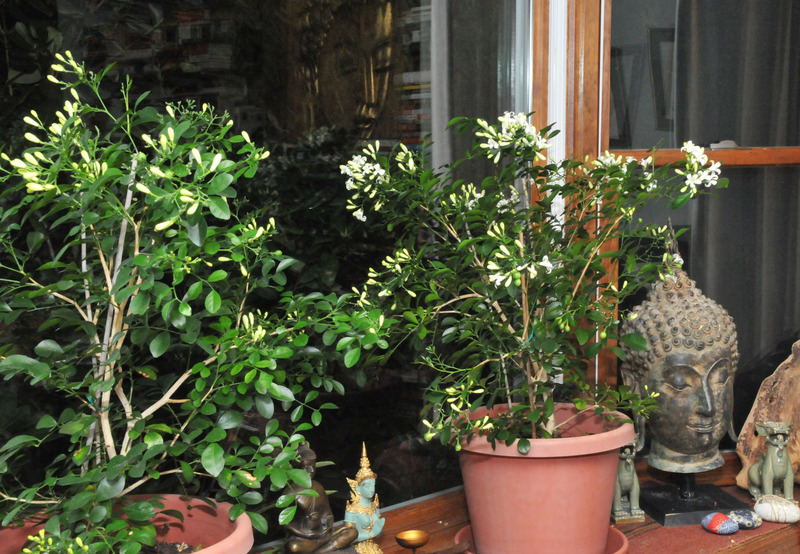 We have two Orange Jasmine (Murraya paniculata) that have never stopped blooming. 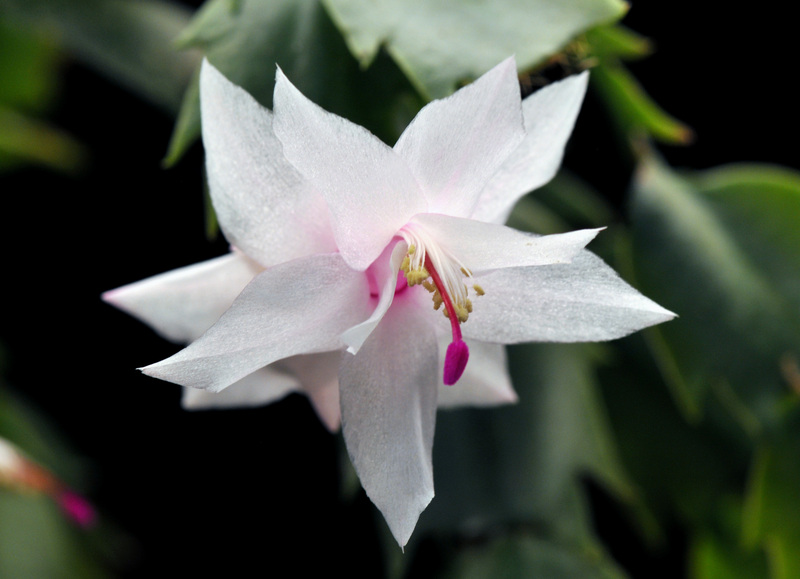 It doesn’t matter where they are, under artificial light in the basement, in the bay window or on the pool deck in summer, they bloom. 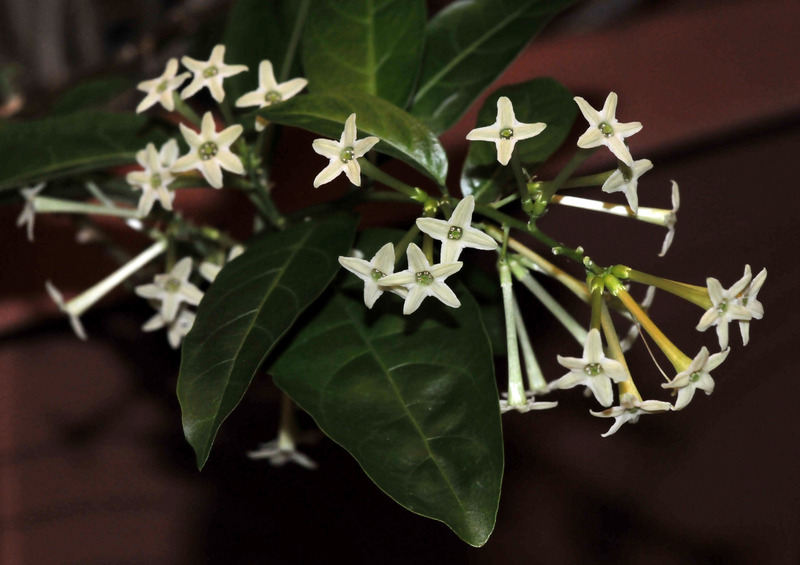 They deliver that delicious scent reminiscent of the tropics in the middle of winter. 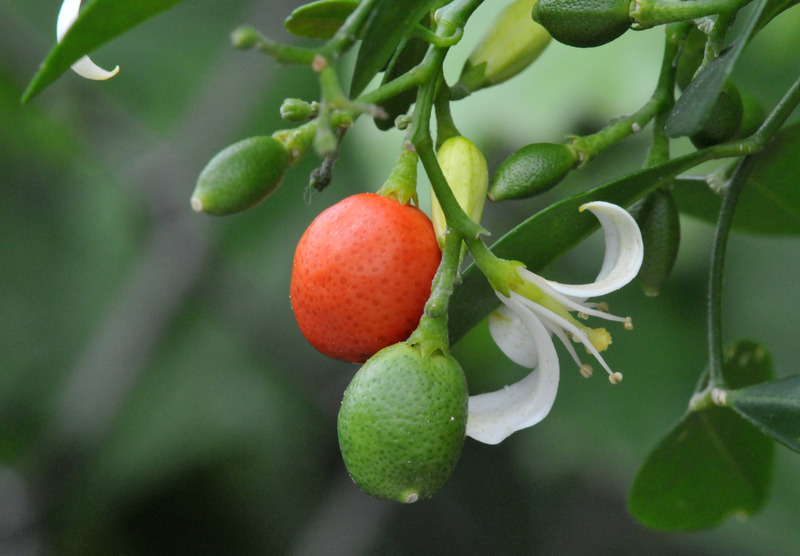 I let the flowers set fruit that look a little like small oranges and take a while to mature to a bright red. I didn’t think the seeds would sprout, but I put each one of them in individual pots anyway. I took a chance since air-layering on tropical plants is hard to do because of the very short summer in my area. If the seeds sprout, great. If not, I have nothing to loose. Surprisingly enough, four of them came up. 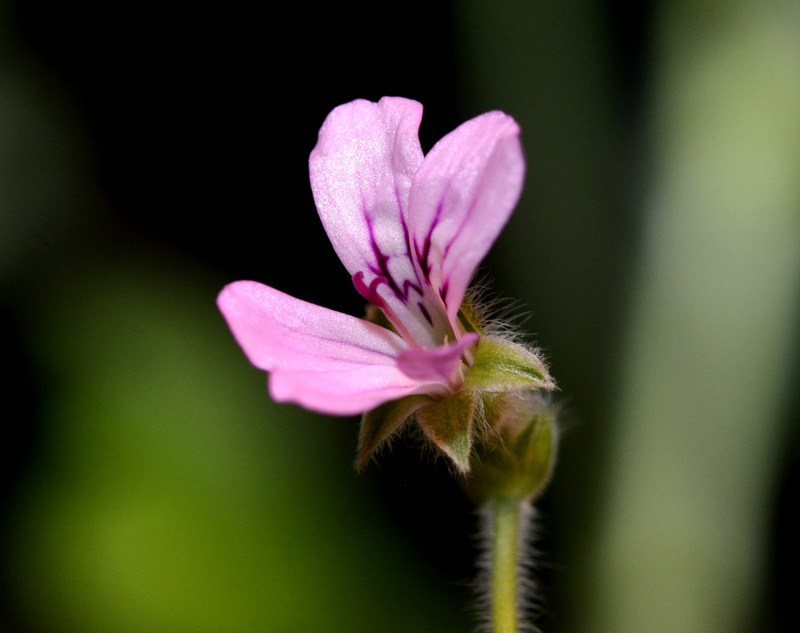 Even more surprising to me was that when they reached an inch and a half tall, they flowered. 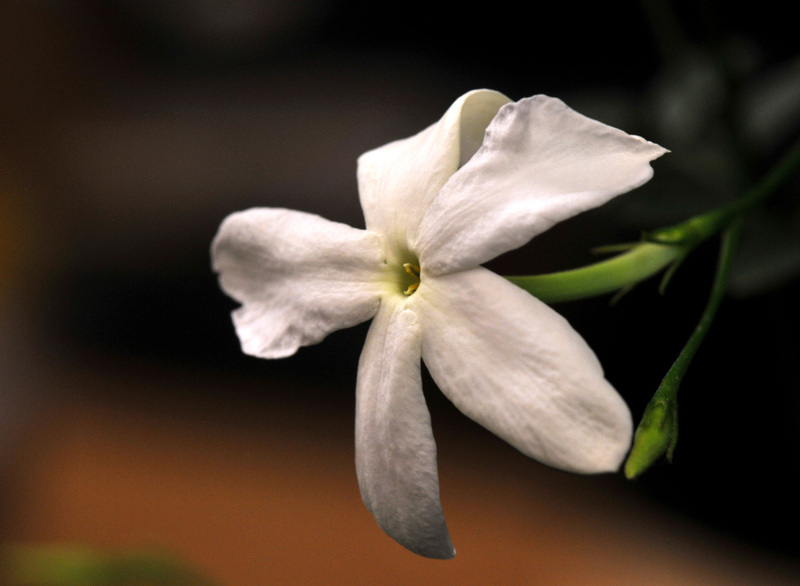 A little white flower perched on the top of each plant. I expected them to take a year or two before flowering. I guess growing in mostly compost helps. 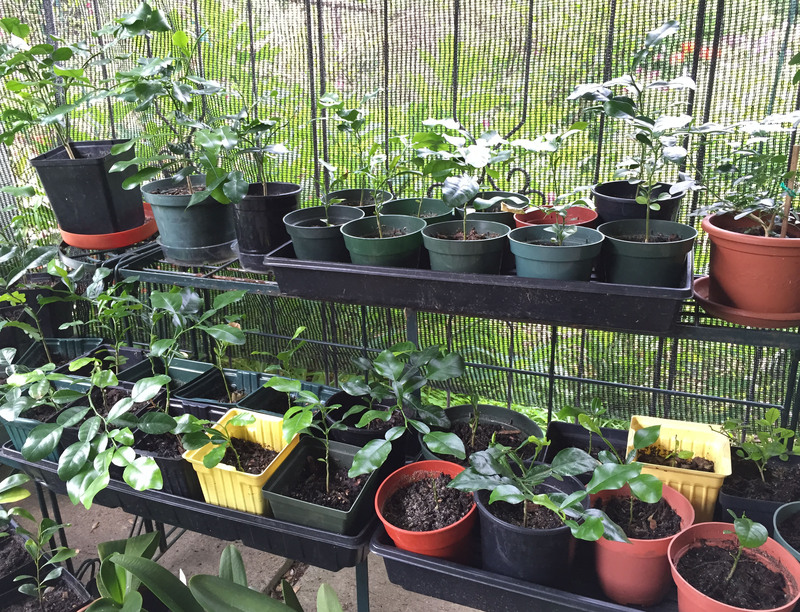 This summer, I let the fruits fall in the parents pots and let nature do the work. I have a couple more seedlings now. 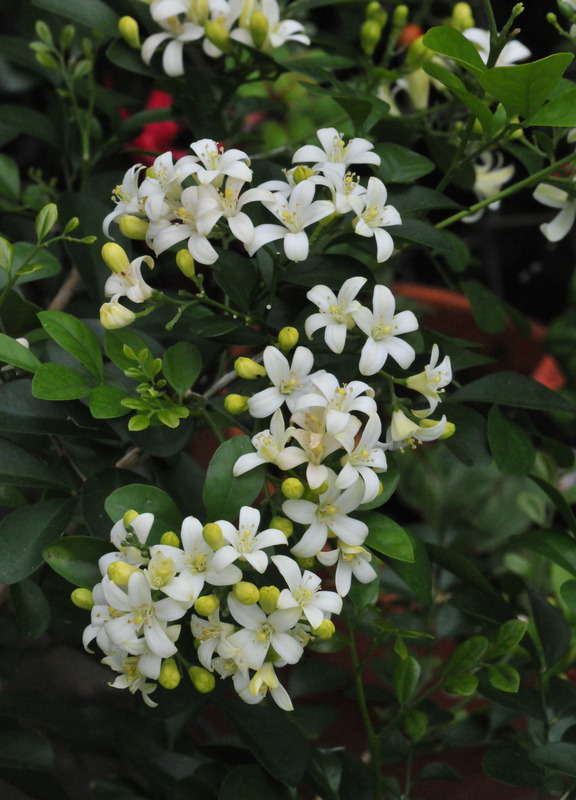 I only wish I could grow them outside so I could have a whole hedge of Orange Jasmine that would perfume the garden year round. Their fruit looks a little bit like tiny limes or oranges for that matter. 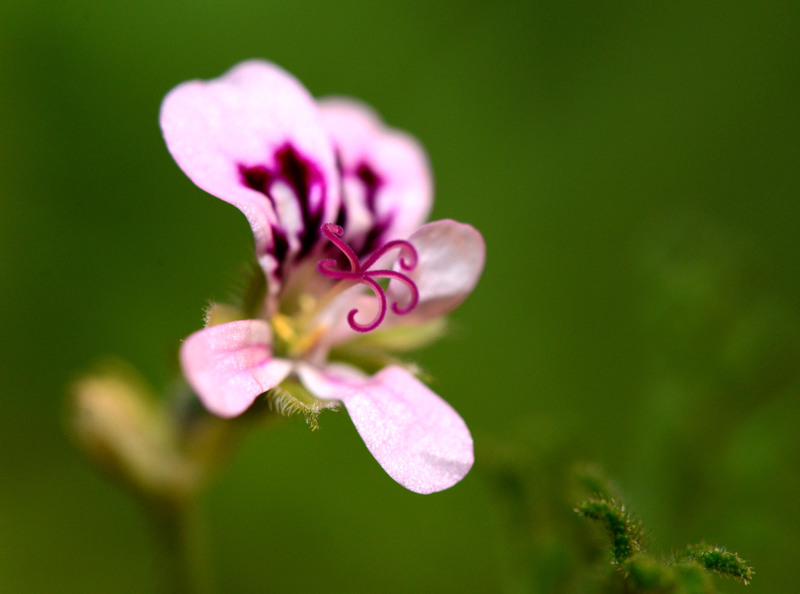 These are little flowering seedlings. They are only a little bit over an inch tall. 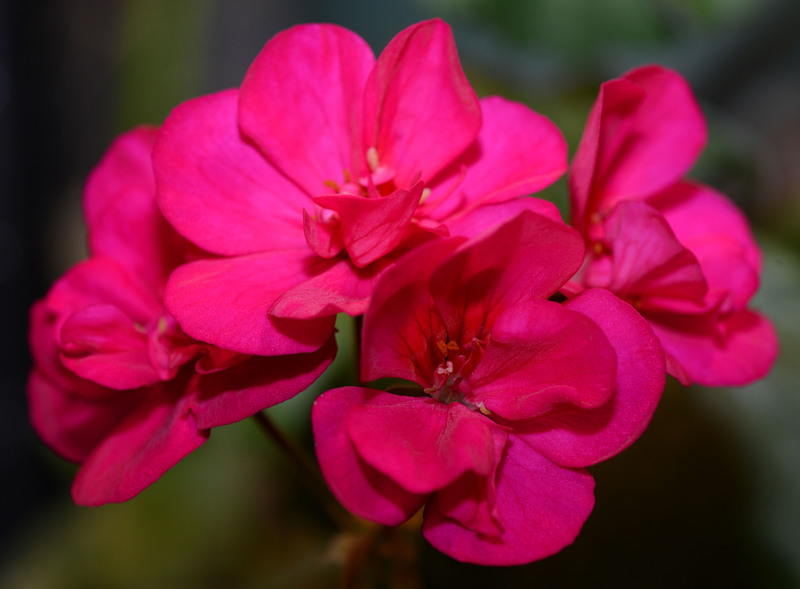 I don’t like photographing flowers at night; they never come out the way I want them to. Tonight was an exception. I got a text message from Bill while on the train coming home. 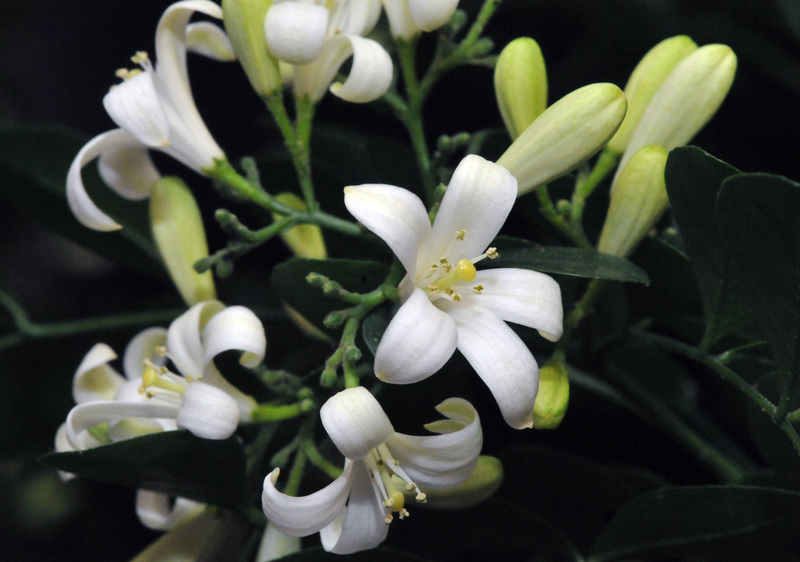 Having arrived home ahead of me, as soon as he opened the door a strong but delicate fragrance of Orange Jasmine (Murraya paniculata) welcomed him in. The fragrance permeated the entire house, even to the bath room at the far end of the hall. All of it from just two plants in the living room bay window, each just a foot tall! I mentioned in an earlier blog post that I got these two Orange Jasmines to surprise Bill. 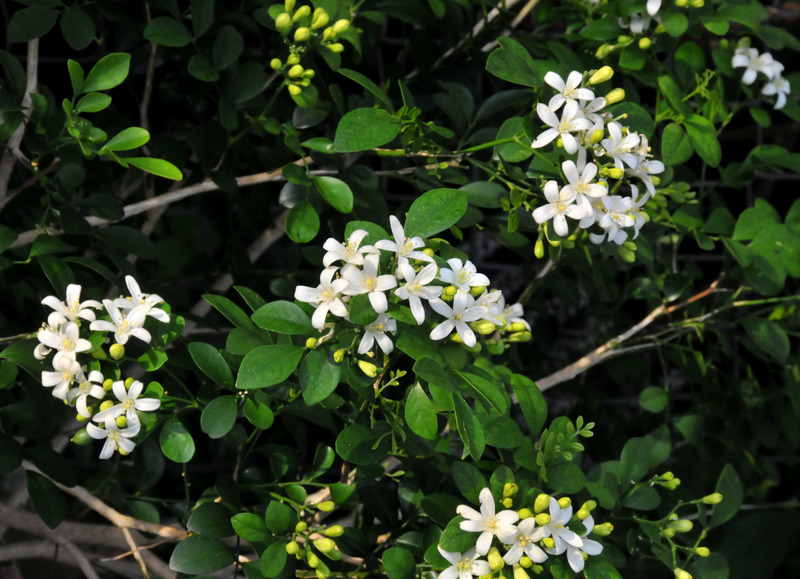 He loved the scent so much when he first encountered it on one of our vacation trips to the tropics several years ago. During winter they reside in the bay window area so they can get real sunlight. Not much but it’s still better than the rest of the tropical gang in the basement who put up with ‘grow-lights’ all winter long. The Orange Jasmines never stop blooming. In earlier years, they did better on the pool deck during summer but the location doesn’t seem to matter to them now. They are easy to grow. Don’t need much…just light, water and food now and then. They’re also fast growing and quick to reproduce. Ours have five kids now. 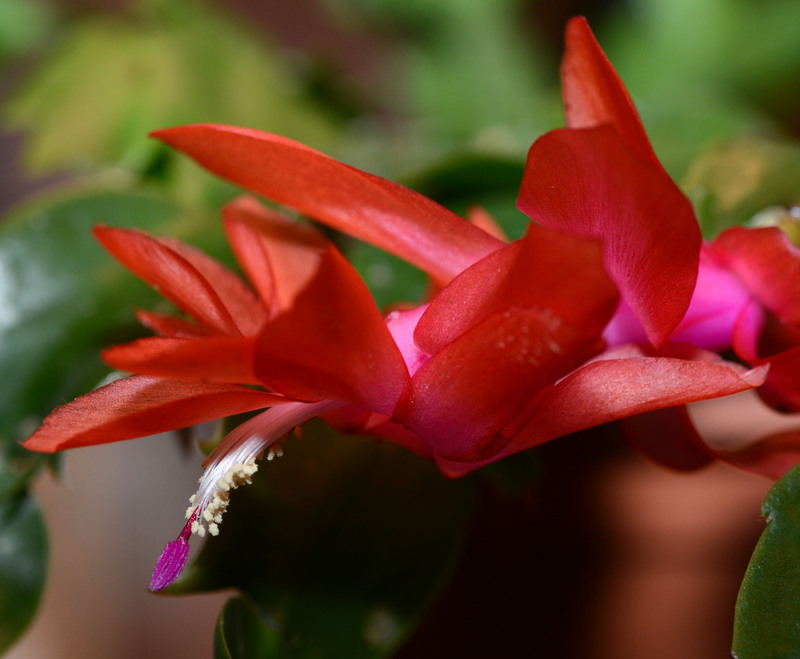 Two of the kids bloomed in the first year when they were only 2 inches tall and they are blooming now in the basement. I will have to re-pot them this summer to give them more leg room. The left one in the photo produced one little seedling in the pot that needs to be given its own space. They are great to come home to after a long day at work. Just close your eyes and the scent transports you right back to the tropics, minus the heat and humidity. The fragrance gently washes over one self and the dystopian odor of the big city melts away. A soothing way to unwind with a glass of wine and legs propped up.